At the end of a good biography, you want to feel a sense of loss when you finish the final chapter. Whether the person was a hero or villain, if you've truly come to know that person through the book, you've accompanied them on life's journey, and you're saying goodbye to them. 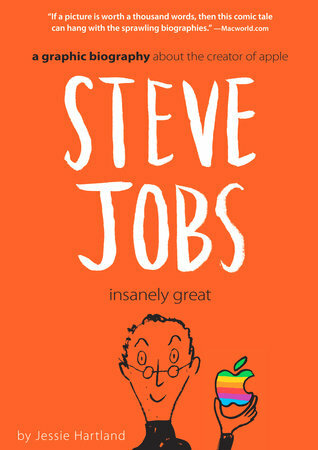 Finishing Steve Jobs: Insanely Great by Jessie Hartland had that feel to it. I came across the graphic novel last year as part of the National Council for the Social Studies/Children's Book Council list of Notable Trade Books for Teaching Social Studies. I had the honor of serving on that committtee for three years, and it's been a great resource for me. I may have stumbled upon Steve Jobs: Insanely Great on my own, but seeing it on that list bumped it up a notch. Hartland structures the graphic novel chronologically, but this book is far more than a look at Jobs' life. 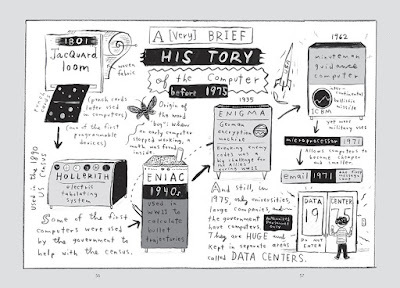 She's able to draw out the pop culture of the period, and the technology necessary to tell the story of the Apple founder and the contributions he made to the tech world -- and our lives. Starting with his childhood in northern California and parents who encouraged his tinkering through junk-scavenging and gifts of electronic kits, we see a man whose curiosity and ambition would lead him to change the world. I've been immersed in biographies of "creative" types lately -- Jim Henson, George Lucas, Charles Schulz, Walt Disney -- and Jobs seems to have a lot in common with them. A mastery of the status quo, but having a vision that goes higher and sees further than that narrow view. And with that mastery, sometimes comes arrogance, and a personality dismissive of anything not up to their standards. Hartland does a good job of addressing Jobs' notorious hard-to-work-withness, while still keeping his humanity intact, and getting at some of the roots of his "not good enough" rants that were legendary at Apple. Some of those roots were psychological, but others were simply that if Apple put out something substandard, they may as well not put out anything at all. I'm not an Apple fanboy, but there are things they do well, and Hartland draws out what makes them different from other tech companies, and how much of that can be attributed to Jobs. Would those distinctions have happened without him? Will that innovation continue at Apple now that he's gone? With any biography you make choices about how much of their personal life to include, and the author puts in enough about his relationships and children to give you the broad strokes, but the book is much more about his personality, his passion, and accomplishments than his roles at home. The artwork is distinctive and stylized, cartoony and kind of messy, but after a few pages I was into it and enjoyed it. She uses an interesting mix of messy, cluttered pages and clean lines, which seem to explode and then narrowly focus as Jobs' ideas did themselves. If you ask most students what the most important invention of the last hundred years is, they'd probably say their phones. Of course, when they mean "phones," they're meaning the handheld computer/music player/GPS/all-in-one tool that is sometimes used to talk to someone with their voice, which is what a phone was when I was a pup. Steve Jobs: Insanely Great does a fantastic job of outlining what the state of technology was in the 1960s, 1970s, 1980s, and 1990s, and how Steve Jobs intersected with the technology of those eras. Each of those two-page spreads features a dozen or more different kinds of tech. You could have students do a little bit of research on those, and then connect them to their lives today. With the resurgence of vinyl, kids might have record players in their homes again -- but a lot of them wouldn't have a VCR. Looking at inventions of the past can help inspire kids not just in our STEM and STEAM classes, but in all subject areas. Apple's advertisements have a prominent place in the book -- everything from posters to magazine ads to the famous 1984 commercial. Having students compare the vintage ads for Apple products to IBM, and create their own ads for either vintage or current products based on that template would be a great way to connect them to the period. 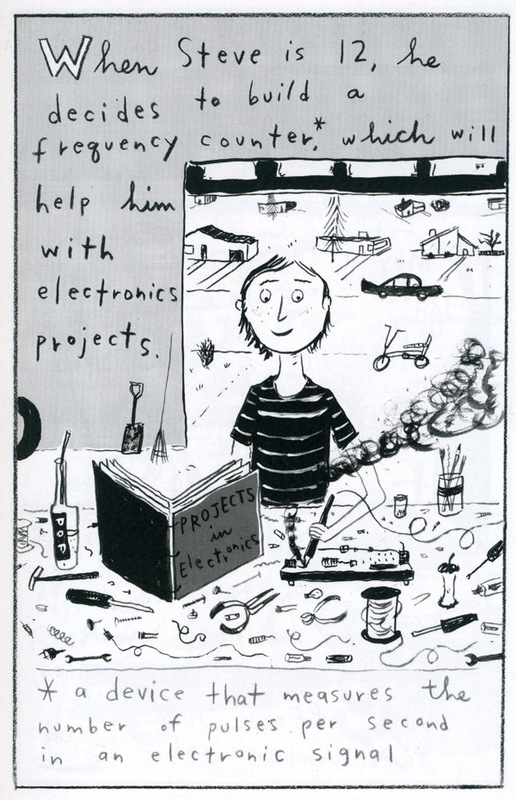 Hartland includes an extensive bibliography -- kids who are interested in Steve Jobs (and a lot of them are) would be able to use this as a jumping-off point to do more extensive research. It would be interesting to follow up on some of the quotes about him that paint him as particularly saintly or particularly...particular. He was a polarizing figure who changed all of our lives. He's worth getting to know, and this book is a great place for kids or adults to start. LEGO Set of the Month: Mighty Dinosaurs!